A couple of days ago, I found a new Bible. It was just published on February 29, 2016, and it’s the most amazing Bible I’ve ever seen–one which I believe I’ll use and keep the rest of my life. It’s the leatherbound ESV Journaling Bible, Interleaved Edition . It’s not going to be for everybody, but it is for me; and if it’s your style too, I wanted to tell you about it. This Bible is patterned after the Bible that my hero, Jonathan Edwards, had made for himself. Edwards took a Bible apart and had it rebound, with a blank page sewn in between every page, so he could write study notes directly in his Bible with ease. I’ve dreamed about having a Bible like that for years, but I had never heard of one being printed. 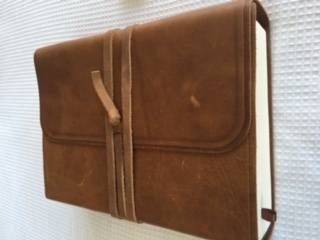 I was actually considering contacting a custom book binding company and having them take a Bible apart for me and re-sew it with the blank pages. This Bible is covered with genuine, natural leather, held together with a leather strap. You close the cover by wrapping the strap around the Bible several times and then tucking it through itself. The leather is soft and pliable. This Bible smells good. It feels good. It’s reasonably heavy (but worth it to me; just keep in mind that it’s not a thinline Bible). 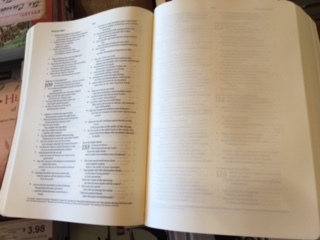 The pages are cream-colored and are thicker than normal, thin onion-skin Bible pages. And there is a blank page in between every single page of Scripture. You can write notes on your blank pages. You can draw or record prayers. If you’re a songwriter who mines Scripture for the best lyrics of all time, you can write down the songs the Lord gives you. Whatever. The print is decent to read, but I usually buy large-print Bibles, and this is not that. It’s 7.5-point font. But I’m doing just fine with the print size. Also, this is not the kind of Bible that has a lot of notes to help encourage you or help you study. It has a few footnotes here and there to explain wording or give alternate wording, but it’s made for you to put your own study notes in. I plan to use this Bible the rest of my life. It’s well-made, durable, and is, in my opinion, of heirloom quality. If you’ve been looking for a Bible like this, click here to grab the Journaling Bible, Interleaved Edition on Amazon! It looks great but very expensive! I like this! I got an adult coloring book for my birthday, and have looked at the Bible journaling. This would be better,more space. And you’re not the only person who hugs things. LOL! Like a little child, right? 🙂 And enjoy your coloring book! I haven’t tried one of those but they look fun! What is it that makes Jonathan Edwards your hero? I’ve heard him called the “epitome of Calvinism” and “the greatest theologian America ever produced”, but from what I’ve read of his (which I’ll admit is not much more than several excerpts of Sinners in the hands of an Angry God) it seems, while impressive, and logically sound, so opposite of everything you write about in this blog. Maybe I’ve just read the wrong things or maybe not enough of the right things. Hope you can give me some feedback as to why you admire him and maybe some recommendations as to a few things of his I should read.